Why Does A False Positive Home Pregnancy Test Happen? How To Avoid A False Positive Test Result? Imagine the scenario – you missed your period, took a home pregnancy test and it came back positive. Only trouble is that you are not pregnant! So, what gives? A home pregnancy test (HPT) is a Godsend for women. Whether you are trying to conceive or just worried about an accidental pregnancy – a home pregnancy test gives you the answer in the privacy of your home. But sometimes, a home pregnancy test can turn cruel too. Can a home pregnancy test be false positive? Yes, it is rare, but it does happen. If you want to learn about the whys and how’s of it, read on! Before you try and understand why you can get a false home pregnancy test, it is first important to comprehend how an HPT works. 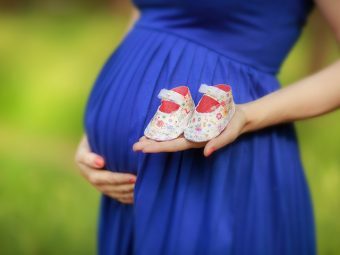 When you are pregnant, your body produces a hormone called Human Chorionic Gonadotropin or hCG. A home pregnancy test checks for this very hormone in your body. If there is a substantial amount of hCG in your body, it passes on to your urine and gives you a positive pregnancy test. Infertility can be devastating. And if you get a false positive while you are struggling to conceive, it can almost break your spirit. But if you are undergoing fertility treatment that requires hCG shots, it is possible to get a false positive. It is because the HPT ends up detecting the remnants of the hCG shot in your body (1). Some pregnancy tests leave an evaporation line when the urine runs across the test strip. Usually when the urine passes, it changes in color, thereby helping you locate the test results. If the test in positive, it will change in color and have a line at the proper testing time. But if you observe no line and it requires to manipulate the light to observe the line properly, it may be an evaporation line. It can also happen when you end up seeing the result after 10 minutes. Most women who show a positive pregnancy test will be pregnant and a few are not. The primary cause of a false positive pregnancy test is that you may not read the test correctly. Pregnancy home tests will have certain instructions that you need to follow correctly. It is important to read the manufacturer’s instructions before taking a pregnancy test. Most test kits require you to read the test after exactly 3 minutes and not to read if it crosses 10 minutes. Once you read the test to be negative after 3 to 5 minutes, you should throw away the test. Any positive test that shows after the time goes inaccurate cannot be considered right. It is very important to follow the instructions given on the HPT. If you fail to do so, you may end up getting your hopes up only to see them break into pieces later! It is one of the most heartbreaking causes for a false positive. For the briefest of moments, your body is pregnant. But the fetus fails to latch on to the uterus. All this happens, many times, before you miss your period. Many times, what many women consider to be a late period is the end of a chemical pregnancy. Your chances of getting a false positive due to a chemical pregnancy go up if you test before your period date (2). Though it is not common, some medical conditions can cause a false positive pregnancy result. Ectopic pregnancy, menopause, ovarian cysts and some rare medical conditions can give misleading results. Certain forms of cancers like choriocarcinoma (cancer found in the uterus), breast, ovarian and testicular cancers can produce hCG leading to a false positive result (3). If you are taking certain medications, such as methadone, chlordiazepoxide, or promethazine, you may experience false positive pregnancy tests (4). 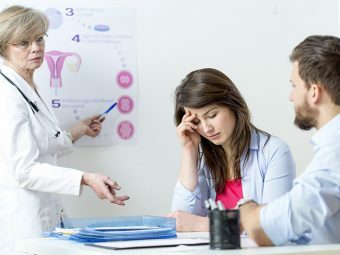 Women receiving hCG shots or any other fertility treatment should consult their health care provider about the accuracy of the home pregnancy tests. The reason is the medications can interfere with the test results by contaminating the urine with blood or gross amounts of drugs. Before you use an HPT, check its expiration date. Many false positives are a result of tests that had passed their use by time. Many times, you may just end up with a faulty pregnancy test, which can give false positives. Some pregnancy test kits usually come with cups. Washing the cup may contaminate the urine sample if you do not wash all the soap or detergent before the test. You should note that these cups are sterile and do not require any washing before using them. The human pituitary gland produces low levels of hCG (5). The hormone is more commonly detected in menopausal women. So, if you are over 40 and get a false pregnancy test, you can blame your pituitary gland for it! Some women with tubo-ovarian abscess too can experience false positive HPTs (6). Women who are suffering from pelvic inflammatory disease often experience this serious health issue. Some women possess antibodies in their blood, such as heterophile antibody, that can interfere with an HPT and give false positives (7). If you are suffering from a renal disease and undergoing Hemodialysis, you may experience a case of a false positive pregnancy test (8). False positive pregnancy results are rare. 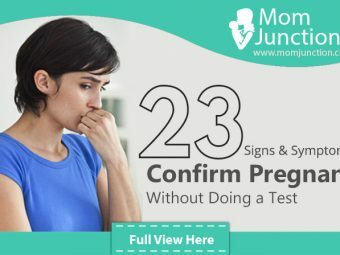 Most of the health experts recommend going for at least two home pregnancy tests to confirm your pregnancy. Trying different brands can reduce the likelihood of misreading the results. Most home pregnancy tests show 99% effective results if you follow the directions correctly. But you should also remember that the positive test can be misleading sometimes. Also, the time you take the test plays a huge difference. It would be best if you wait until you have missed a period and then take the test. Taking the test in the morning gives accurate results since hCG levels are highest in the morning time. If you want to avoid false positives, follow instructions while taking the test. Don’t hoard the test. If it came back negative, throw it away. Reading it after 10 minutes can only pave a way for heartbreak. If your HPT came back positive, the chances are that you are pregnant. If you suspect that the test is wrong, consult your doctor. An expert is what you need to help you out during such confusing times! Have you ever experienced a false positive home pregnancy test? Share your experience with us in the comments section below!